Easy check in. Great decor. A laundry was most welcome. Kitchenette was wonderful. A 5-10 minute walk before your at the shops/ restaurants of Langaveur... which is probably better for noise levels. We walked everywhere in town... to the church, harpa, harbour, restaurants. 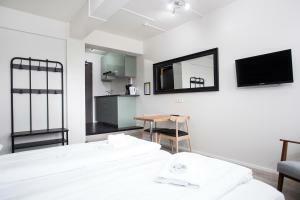 The room is nice and bright, comfy beds, equipped kitchenette.. microwave, fridge and stove top (no oven). There was a family with kids in the room next door that we couldn’t hear so good soundproof walls. Easy self check in and out. Super nice & spacious room. Super easy check in - out. Full laundry machine on site. Has elevator access fo all room. Love everything here. The apartment was very nice and comfortable. Checking in and dropping off keys were easy and I loved that it was located close enough to walk to the local nightlife scene and close to restaurants. Parking was easy and convenient. Location, comfortable, very clean, kitchen had all appliances, access to laundry, loved the privacy for check in and check out, it was made so easy. Thank you. Walking distance from the downtown shops and restaurants. Right off of the main highway. Great location and a comfy place to stay. Since we had a rental car, this location was excellent, a short drive from the downtown area with free parking. This family studio was very spacious with a dining table, sofa, and kitchenette that we used a lot. Soap, trash bags, dish towels provided in kitchen. Bathroom also had soap and a hair dryer in the room which is great since we didn't bring one from home. Used the free washer/dryer once - took a long time to dry but no charge. Also they gave us the option to pay 1/2 price for the night before our arrival in order to check in as soon as we arrived from the airport around 9am which was fabulous as my teen daughter needed a nap after the overnight flight. 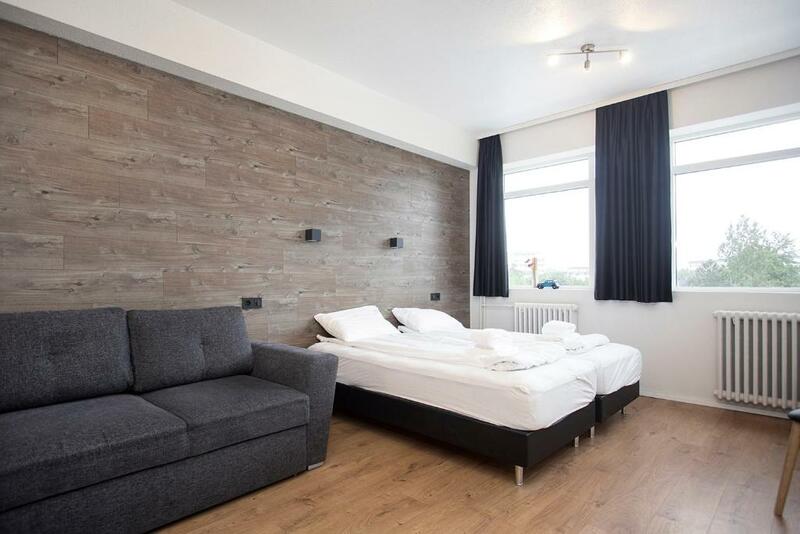 Lock in a great price for Stay Apartments Bolholt – rated 8.6 by recent guests! 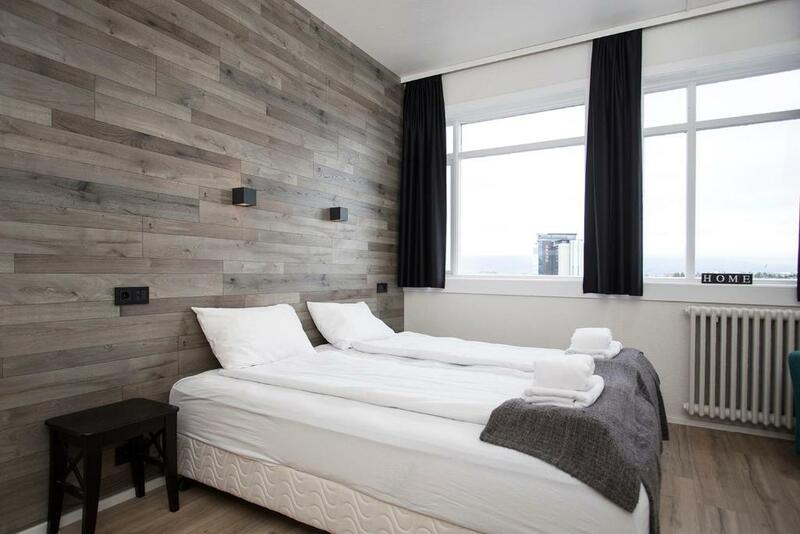 One of our top picks in Reykjavík.Stay Apartments Bolholt is located 25 minutes’ walk from Reykjavik city center. It offers self-catered studios, some with magnificent bay and mountain views. All apartments at Bolholt have private bathrooms with showers, well equipped kitchens and free WiFi. Leisure options include a lounge. Laundry facilities and parking are free for guests. 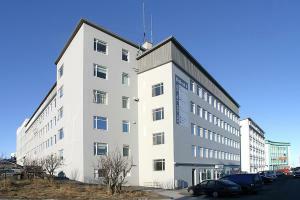 Kringlan Shopping Center is located 10 minutes' walk away. Laugardalur Park, with its botanical garden, zoo and swimming pools, is a 10-minute walk. When would you like to stay at Stay Apartments Bolholt? This studio has a seating area and a bathroom with shower. The kitchenette includes a fridge, microwave and dining area. This studio has a seating area, sofa bed and a bathroom with shower. The kitchenette includes a fridge, microwave and dining area. This apartment has two separate bedrooms, seating area, dining area, kitchen facilities and a private bathroom with a bath with overhead shower and a hairdryer. Towels and bed linen are included. PLEASE NOTE: Guests need to walk up one flights of stairs to access the apartment. Stay Apartments Bolholt is situated 25 minutes’ walk from Reykjavik city centre. It offers self-catered studios, some with magnificent bay and mountain views and free WiFi. My name is Halldór Meyer and have owned and operated Stay Apartments for 11 years now. We want you to feel like home when staying with us and therefor our consept is based on a home away from home ideology. We are continuously thinking of ways to improve our apartments and use our surplus profit to improve them whether it is design, comfort or practicality. We know that when our guests leave happy, we are on the right track. Kringlan Shopping Centre is located 10 minutes' walk away. 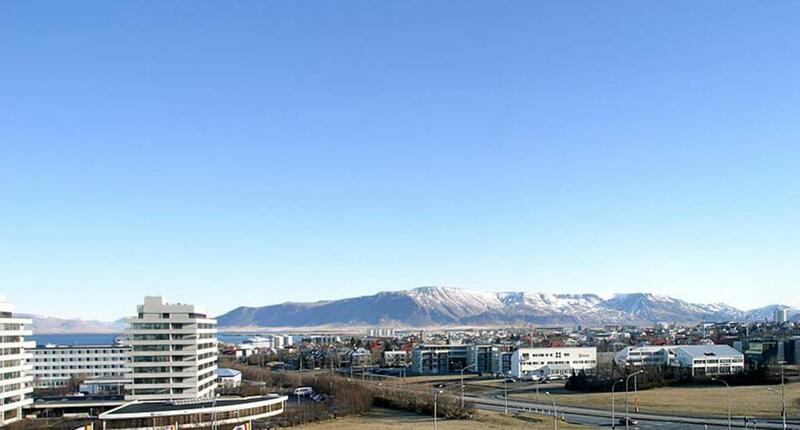 Laugardalur Park, with its botanical garden, zoo and swimming pools, is a 10-minute walk. House Rules Stay Apartments Bolholt takes special requests – add in the next step! Stay Apartments Bolholt accepts these cards and reserves the right to temporarily hold an amount prior to arrival. 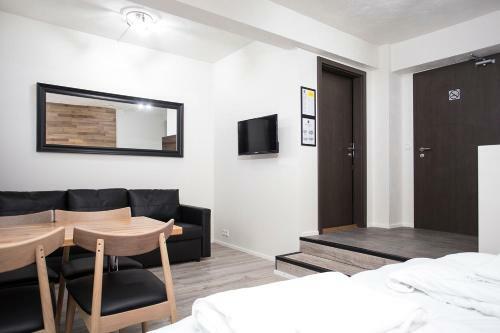 After booking, guests will receive a door code and check-in information from Stay Apartments Bolholt via email. Please note that Stay Apartments Bolholt has no staff on site. They can be reached via the free telephone connection in the lobby. Charges will be made in EUR or ISK according to the exchange rate on the day that the charge is made. - Parking spaces said you'd be towed away, which scared me off at first. - Windows can hardly be opened, therefore a bit of a lack of fresh air though I understand it is due to heavy winds in Iceland. + Really good location, the center and many other interesting places are in walking distance. + Free parking spaces directly in front of the place. + Self-organized place. You don't really see anyone there, can get towels or bedsheets yourself if needed, but all is proerply explained before. + Room is well equiped and has all the cooking equipment you want )cooking plate, microwave, cuttlery, pots, water boiler, toaster,...); the fridge is not too loud and doesn't bother you during the night. + Wi-Fi worked nice and fast. I liked the room and the facilities provided. It was a little removed from the center of town but for those with a car it will not be a problem. Hall way smelled really bad because someone decided to keep their grocery food in the hallway the whole time we were there. Drains weren’t draining very well. Two of the three rooms we booked didnt have enough beds for a family of four and the sofa bed was uncomfortable. The hand shower was not holding up. House keeping was disappointing- no shampoo, conditioner. The whole apartment also smelled liked fish some days. Kitchenette was very useful and the location and security was great. The room was very hot hard to sleep until we turned off all the heat and opened the window. The fridge was turned up to far and froze all our stuff before we noticed the problem. It would be helpfull to have recommended settings for fridge and radiators. Would have been nice to have a broom and dustpan. For some reason a whole lot of water blurped out of the bathroom sink and all over the floor. Shower control stickers are on the wrong handles. Easy to find, with parking at the doorstep. The room could have had a bit more character. There was a lot of empty space and a sitting area would have been nice. Check-in was easy. Kitchenette was well-stocked and we made good use of it, as eating out is so expensive in Iceland. Tour companies pick up and drop off right in front of the apartment. Without oven, oil and spice (there's sugar and salt). Self check-in, and the studio apartment is spacious and clean. Kitchen area is well-equipped but without oven, oil and spice (there's sugar and salt). 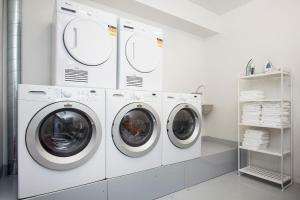 There's also a laundry room which is very nice if you plan to stay for many days. The apartment is close to Bonus supermarket and not far from city centre as well.